A lot has been going on! And I mean, a LOT. Just yesterday we signed our papers and officially turned this blog from a hobby project to a side business (we both still work full-time). We are very excited about it, but still, have a lot to do! And on Monday, we had our first FB Live Cooking Show for the Mu Cuisine brand, along with fellow food bloggers and a very talented production team. We were pumped! The show is in Slovene, but if you like, go ahead and take a look at it over on Facebook. And among all that, we somehow still find time to create recipes… and well, you know, eat. 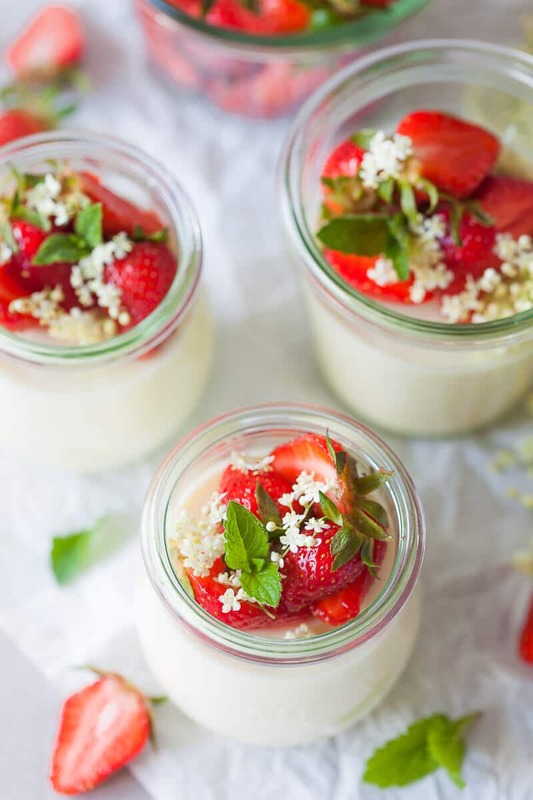 Now, back to this Elderflower Panna Cotta. 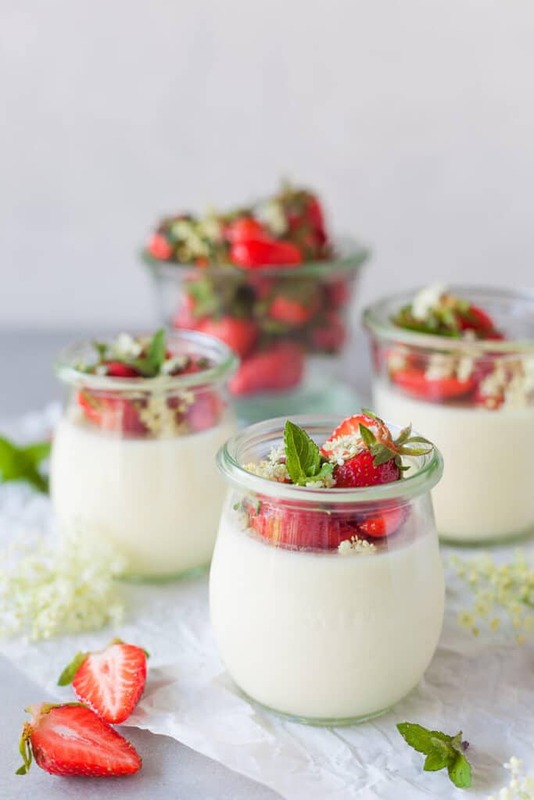 This is a classic panna cotta recipe with a delicious twist – we added a bit of elderflower syrup into the cream for an unexpected burst of flavor, and used elderflower syrup to macerate the strawberries as well. The idea for the recipe came to me when I was at my mom’s just admiring a lovely flowering elderberry bush. I thought about needing to gather a couple of flowers to make a bit of syrup, and then suddenly, just like that… thought to include the syrup in panna cotta. I mean, how could this go wrong? And it worked like a charm! 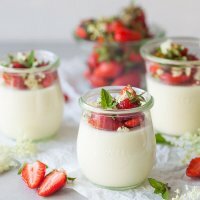 If you like panna cotta, you will love this Elderflower Panna Cotta Recipe. And the recipe is actually extremely easy to make! Just put the ingredients in a pot, simmer on low for a couple of minutes, add gelatin, pour into jars and let it cool off overnight. Then top with some macerated strawberries or a strawberry sauce, and – you’re done! If you happen to find elderflowers you can even make your own syrup, but otherwise just use a store-bought one. This way you can make this recipe in any season! 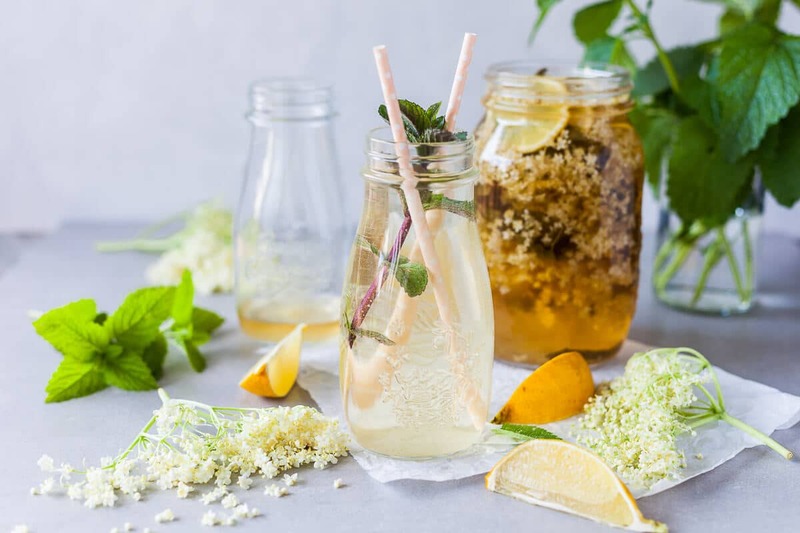 If you'll be making your own elderflower syrup, start a day or two in advance: Pour water in a pot, add sugars and citric acid, and bring to a boil. Mix well and let all the sugar dissolve. Remove from heat and let cool down. Then, add mint leaves, slices of one lemon and the elderberry flowers - remove as much stem as you can and only use the florets. Mix in, then cover the pot with a cheese cloth or a thin kitchen towel, and let infuse for about a day. Then, drain the syrup and pour it in a bottle. Keep refrigerated and use in a week or so. 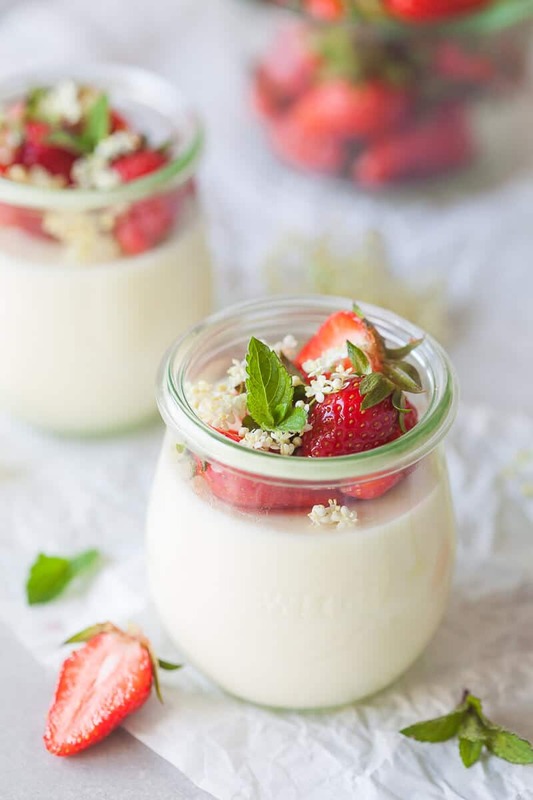 To make the panna cotta: add heavy cream and milk to a pot, add sugar and elderflower syrup. Slowly bring to a low boil while stirring and cook on low for about 15 minutes, stirring regularly, until the cream thickens. Remove from heat. While the cream is cooking, soak gelatin in cold water, according to package instructions (or use agar agar for a vegetarian version). Once soaked, squeeze the gelatin to drain liquids, then add it to the hot cream and stir it in, whisking thoroughly until the gelatin dissolves. Pour the cream in jars or glasses and let it cool down before storing in the fridge. Keep refrigerated for at least 4 hours, or overnight, until the cream firms up. Prepare decoration: Wash and dry strawberries, then cut in half or in slices. Sprinkle with sugar and add 1-2 tablespoon of elderflower syrup. Let macerate for about 15-30 minutes, then add strawberries on top of the panna cotta. Finish your decoration with a couple of elderberry florets and some fresh mint leaves and serve. This recipe is brought to you by Ljubljanske Mlekarne. Their high-quality Mu Cuisine products are made for cooking, stimulating your imagination, curiosity, and sense of experimentation. 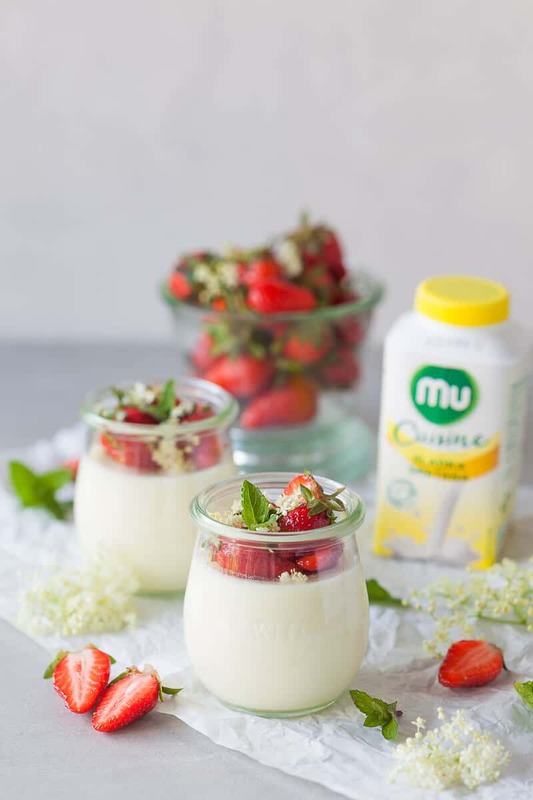 Elderflower has such a wonderful, subtle flavour and it’s even better with strawberries!